"By the time you're done, your biggest problem may be that you wish there was more." "The definitive anthology of poets reading their own work." "This grand immersion in poetry follows the best-selling Poetry Speaks (2001) and includes a never-before-published and truly thrilling recording of James Joyce reading "Anna Livia Plurabelle" from Finnegans Wake. Book and CDs work beautifully together, kindling deeper appreciation for the transmuting power of poetry, a practice of discipline, skill, and magic." ..".The prose comes to life when read aloud, especially when you hear James Joyce read it himself." 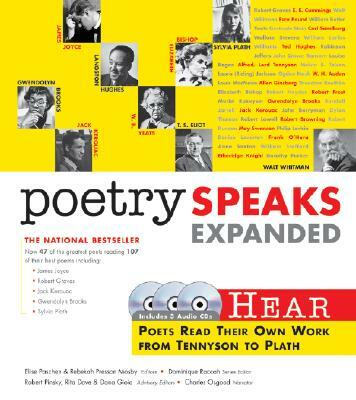 Poetry Speaks Expanded is a fusion of the poet's words with the poet's voice, including text and recordings of nearly 50 of the greatest poets who ever lived, ranging from Walt Whitman, Robert Frost, James Joyce and T. S. Eliot to Langston Hughes, Jack Kerouac, Sylvia Plath, Ted Hughes and Gwendolyn Brooks. "This book has the potential to draw more readers to poetry than any collection in years." "Readers and listeners are guaranteed to hear poems in a new way after spending time with this book and CD set." "Superb, accessible....A unique and essential purchase"
--T. S. Eliot reading "The Love Song of J. Alfred Prufrock"
--Sylvia Plath's anger and raw emotion as she reads "Daddy" and "Lady Lazarus"
--A never-before-published recording of Alfred, Lord Tennyson reading "The Charge of the Light Brigade"
--Robert Frost reading "The Road Not Taken" and "Stopping by Woods on a Snowy Evening"
"The most ambitious, innovative poetry project to be published in years." A Book Sense Top-10 Selection. Elise Paschen is the author of Houses: Coasts and Infidelities, winner of the Nicholas Roerich Poetry Prize, and the co-founder of "Poetry in Motion," a nationwide program that places poetry in subways and buses. She is also the editor of the New York Times bestselling Poetry Speaks to Children. Rebekah Presson Mosby was nominated for a Grammy for her work as producer / editor of the 4CD box set, Poetry on Record: 98 Poets Read Their Work (1888-2006) and also edited the groundbreaking Rhino Records poetry box sets, In Their Own Voices: A Century of Recorded Poetry and Our Souls Have Grown Deep Like the Rivers: Black Poets Read Their Work.